Born in Merthyr Tydfil, Wales, in 1939, as a humble miner's son, Howard Winstone was one of amateur boxing's most promising rising talents, noted for his knockout right hand. That was until his dreams of a professional career were shattered when a fluke industrial accident led to the crushing of Howard's hand and the loss of three fingertips, rendering him incapable of making a proper fist. Severely depressed, Howard believed he had lost everything. Against the odds, under the guidance of a new trainer and with the unfailing support of his father, he adapted his technique and developed a new style of fighting that saw him once again rising victoriously through the amateur ranks. Having won 83 of his 86 amateur bouts, by the time of his first professional fight Howard had overcome adversity to establish himself as a potential contender not only for the British and European Championship titles but also the World Championship title. Inevitably, though, success would have a price. With his marriage to his childhood sweetheart falling apart, a series of unsuccessful challenges for the World title and with the hopes of a nation resting on his shoulders, the pressures were mounting. Now the question was, did Howard Winstone have what was required to become the Champion of the World? Produced and co-written by director Neil Jones (The Lost) and star Stuart Brennan (Jack Said), and co-starring John Noble (Fringe; The Lord Of The Rings: The Return Of The King), Shane Ritchie (EastEnders), Boyd Clack (High Hopes) and Grainne Joughin (The Lost), Risen is one of only three movies ever to have been supported officially by the World Boxing Council (the others being The Hurricane and Million Dollar Baby). Adding to its pedigree, the film features cameo appearances from a host of real-life fighters including five-time World Boxing Champion, Erik Morales, British World Champion, Alan Minter, Olympic Gold Medallist and Heavyweight Champion of the World, Leon Spinks, the first officially licensed British female boxer, Jane Couch, plus world champions Tim Witherspoon, Enzo Maccarinelli, Steve Robinson, John H. Stracey, Glenn Catley, Richie Woodhall, Robin Reid and Junior Witter. Star Stuart Brennan spent five years preparing for the role of Howard Winstone, training with Howard's best friend, Don James (who appears in the film as Billie Evans), and reached a standard of boxing where he could have turned professional (and was actually made an Honorary World Champion by the WBC; an honour only bestowed on the very few including Nelson Mandela, Bill Clinton and the Pope!). Stuart's skills allowed Risen to become the first boxing movie to portray full-contact fight scenes in which the lead actor actually trades blows with his opponents. This, combined with the first ever use of the HD Glove Cam, add an extra dimension to the film, making it a must-see movie for all boxing fans. 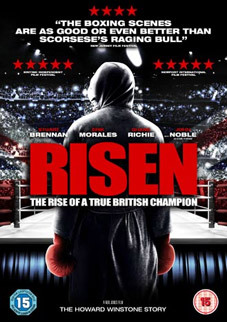 Risen will be released on UK DVD on 30th May 2011 by Scanbox Entertainment at the RRP of £12.99.